My sangria repertoire is becoming quite vast. As I’ve said before, sangrias are great beverages for seasonal fruits and flavors. They’re also easy to batch for large gatherings. I made several sangrias for soccer tailgates last summer, and they didn’t last long once I got there. I got on a pretty big blood orange kick last year and was excited when I saw them at my grocery store for the first time last month. Remember my Old Fashioned Punch? That was my first foray into blood oranges. Recently I made a blood orange bundt cake that I can’t wait to make again (and then share the recipe with y’all on here, of course). 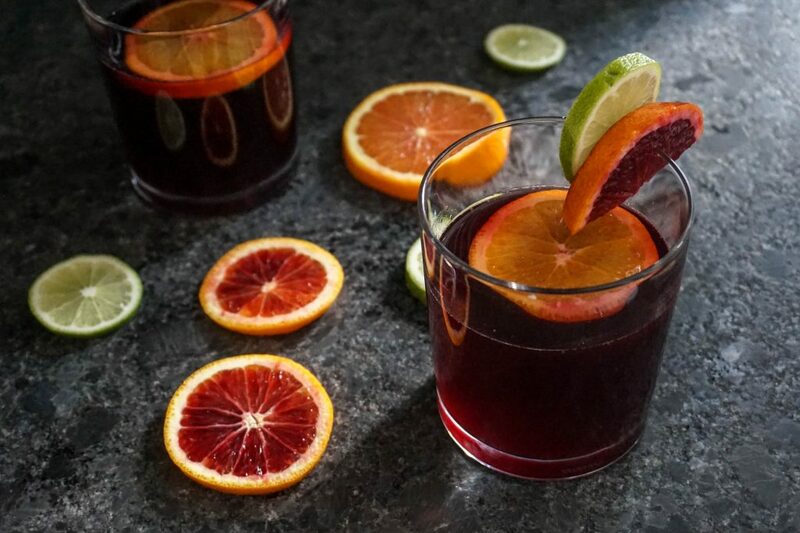 After experimenting with some other blood orange cocktails, it only felt right to make blood orange sangria. I used a cabernet as my base, which is what I use for most of my red wine sangrias. Don’t splurge on an overly “good” wine for your base. The $3 Winking Owl variety at Aldi is all you need. Also, I always suggest letting your sangria chill overnight. It gives all the flavors enough time to blend together, and will be at peak taste after 18-24 hours. If you can’t allow that much time, 2-4 hours works, too. And lastly… I know traditional, “real” sangria has brandy in it. I don’t like brandy. It makes sangria too sweet, and I’m not big on overly sweet sangria. It kills the flavors of the fruits, in my opinion. So I nix the brandy, and it tastes just as good without it. 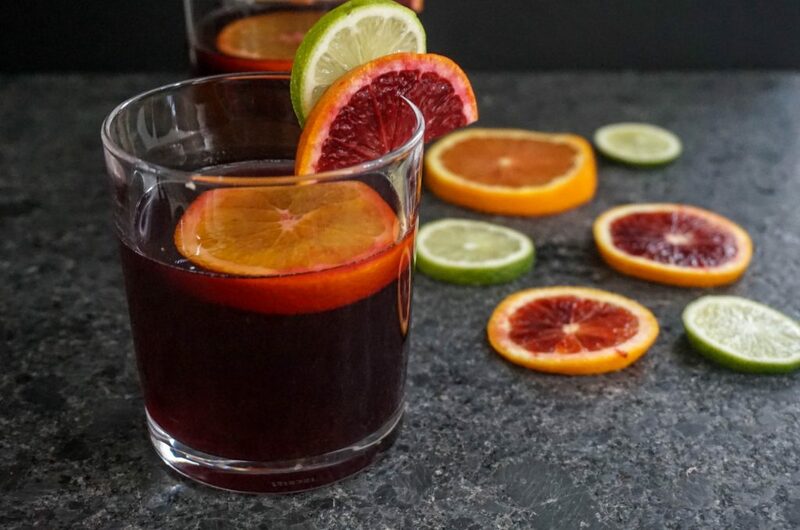 Here’s my Blood Orange Sangria recipe—made with seasonal citrus and red wine. 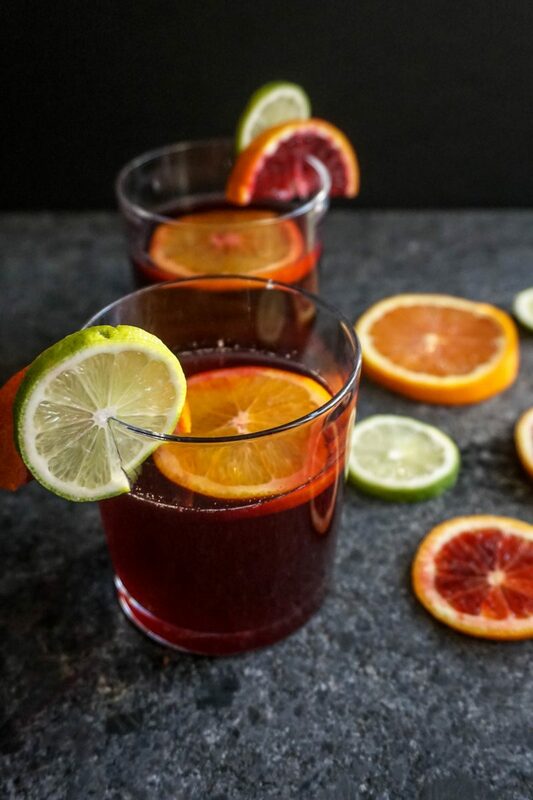 I love how this one turned out, so I’ll definitely be making it again before blood oranges go out of season. Put sliced oranges and lime in the bottom of a pitcher or carafe. Add juice, rum, vodka, and triple sec. Mix well. Fill rest of the pitcher/carafe with sparkling water or club soda and mix again. Chill for minimum of 2 hours before serving. Best if left overnight and served the next day. If you want to add more of your favorite citrus fruits, go for it. Grapefruit would be a nice tart addition, if that’s the flavor you like. A mix of different oranges would be nice, too. Do you like blood oranges? Have you used them in cooking, baking, or drinking this year?